A Piper likes a snack. According to her, snacking is one of her favorite hobbies. She takes a snack to school every day. She looks forward to snack time all day. She keeps a spare snack in the car. She’s never without. So we made up a little shelf in the kitchen so Piper could pack her own snack. It’s on a low shelf just for Piper. Her selection looks pretty healthy, doesn’t? Tamari almonds. Trail mix. Peanut butter pretzels. Carob cashews. Seaweed. Piper would be quite the health nut except…she really just likes to lick all the tamari and salt off of those almonds and peel off the sugar peanut butter parts from the pretzels. Trail mix? Piper prefers to pick out the chocolate bits. Sometimes a raisin gets in her mouth by accident. The seaweed? She devours it. She can’t get enough. Piper doesn’t care what the other kids say at snack time and they say plenty about her love of seaweed. Her snack loves her and that’s enough for Piper. 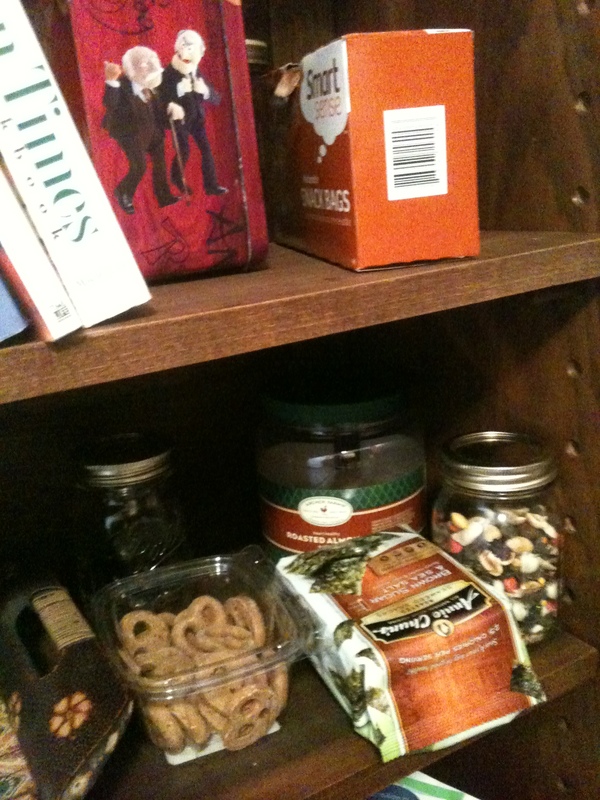 This entry was posted in Antics and Adventures and tagged packing a snack, seaweed, snacking, tamari almonds, trail mix by melissa.scholes.young. Bookmark the permalink. Alex is in excellent company. I’ve been told that he and Isabelle have seaweed eating contests on occasion.